I am starting to work on the clothes the boys will need for summer. I've gone through the clothes I saved from when the big kid was little and found that there is a severe shortage of 3T summer clothes. I am not sure why this happened, because I saved practically everything - I must have been going through a purging phase at that time. So anyway, he is definitely going to need some tees and some shorts. I wanted to use applique on the kids' shirts to make them more interesting and something they would be more likely to pick out of the closet themselves. I had ordered this cool ocean blue tie dye from Girl Charlee (the fabric seems to be NLA, the link is my referral link) and I decided to applique a shark onto it for the little guy. The fabric does remind me of deep water so a shark seemed appropriate. And the little guy plays with a toy shark in the bath and likes to pretend that it is eating cars and people and soccer balls, so I thought he would be excited to have a shark on his shirt. I found a picture of a shark that I liked by searching Google images and then I used photoshop's pen tool to trace around the shark (although you could easily do this by hand with tracing paper). I then printed out my outline and traced it onto freezer paper. You can actually print directly onto freezer paper - I'm not sure why I didn't do that. This big kid is in to Max Steel these days, so he got a Max Steel shirt. 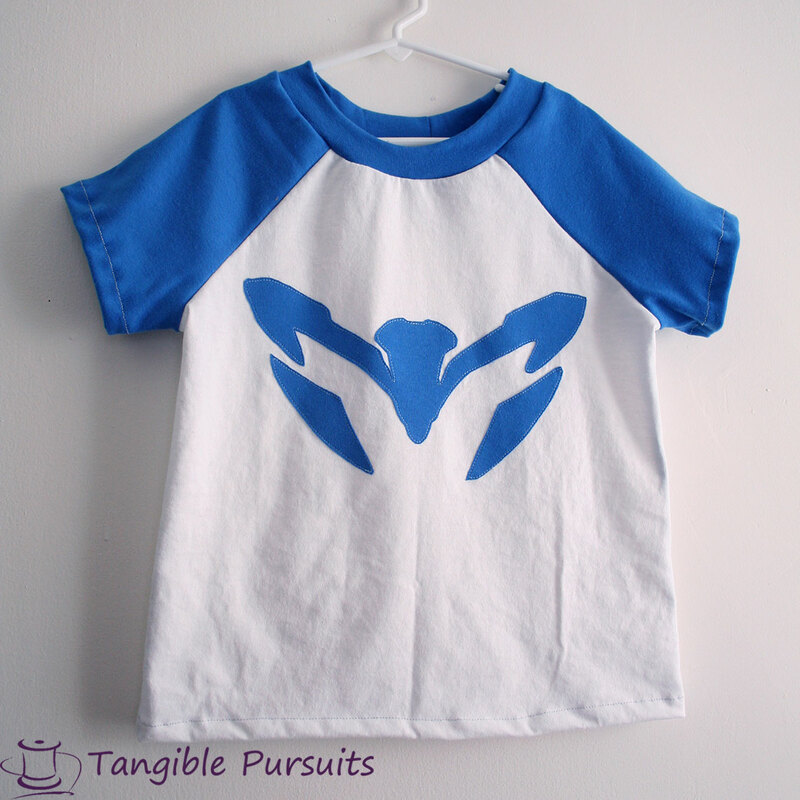 The pattern I used for the little guy's shirt was the raw-edged raglan from Sewing for Boys (affiliate link). I just didn't leave any raw edges. The big kid's shirt is a raglan tee pattern from Simplicity 5125. Next time I make this t-shirt though I will definitely add two or three inches to it. The tees are wider and shorter than I like and than the off-the-shelf ones he has in the same size. Those are really cute, I especially like the shark one! Thanks Noelle! the little guy wanted to wear the shark one today, but it was too cold! I hope it gets warm soon! Both shirts came out really cute! 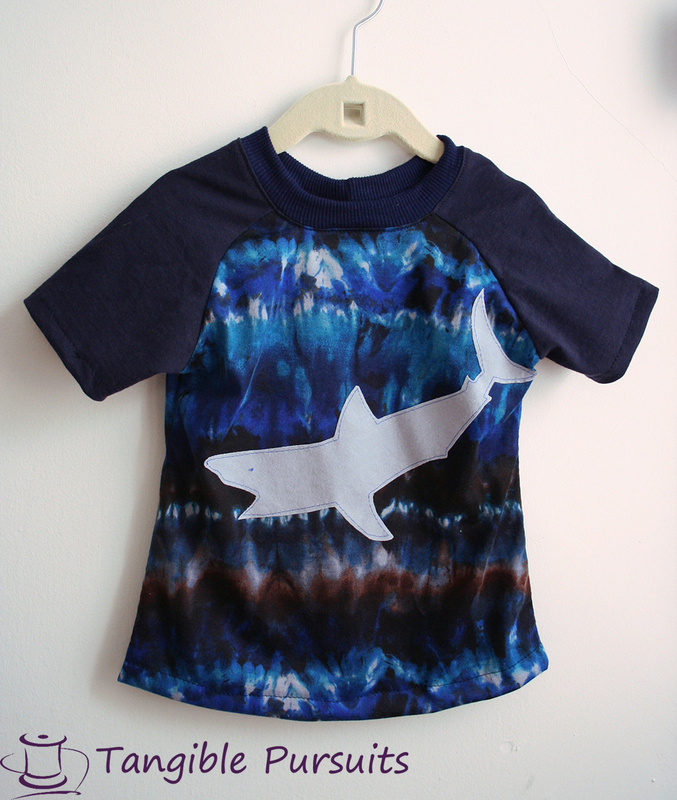 I love the blue tie dye fabric you used for the shark shirt. I know - that fabric is great! doesn't look like the kind of tie dye I am used to seeing. It has such interesting color variations in it. 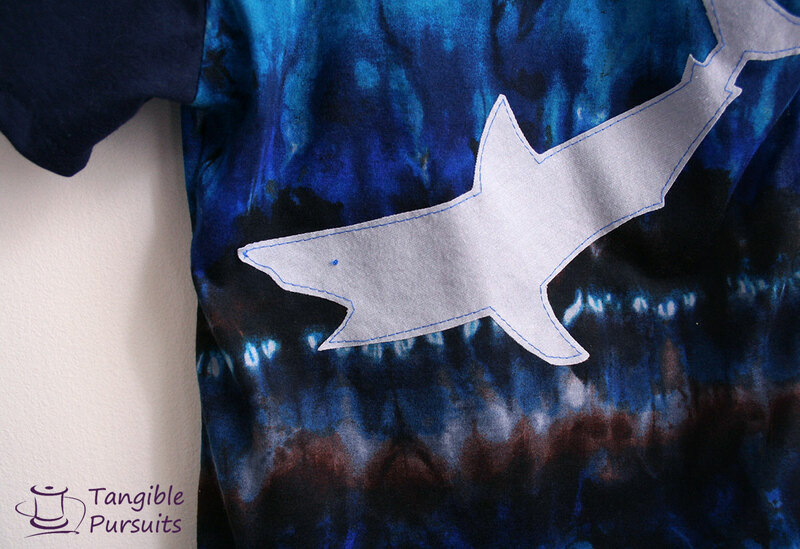 Love that tie dye fabric...the shark applique is perfect! :) I've found Simplicity patterns run short too. I just made my son a jacket and it seems shorter than 'normal'. I need to remember to lengthen their patterns or at least check the length before cutting first. Yes - definitely need to double check the length next time. My big kid is tall for his age too. I will have to write a note on my pattern piece for this shirt to add length next time I make it. That shark applique is so striking on that fabric -- great choices! I'd love to see you join us at the Inspire Us Thursdays link party on www.theinspiredwren.com. Thanks Ren! 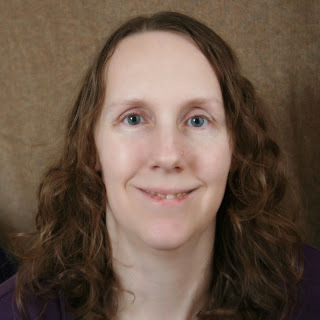 I did hear about your link party and meant to link up - thanks for the reminder! Glad I could remind you. Thanks for linking up! Thanks for linking up with Tuesday Sews at PiePie Designs!! Those are both great tees! 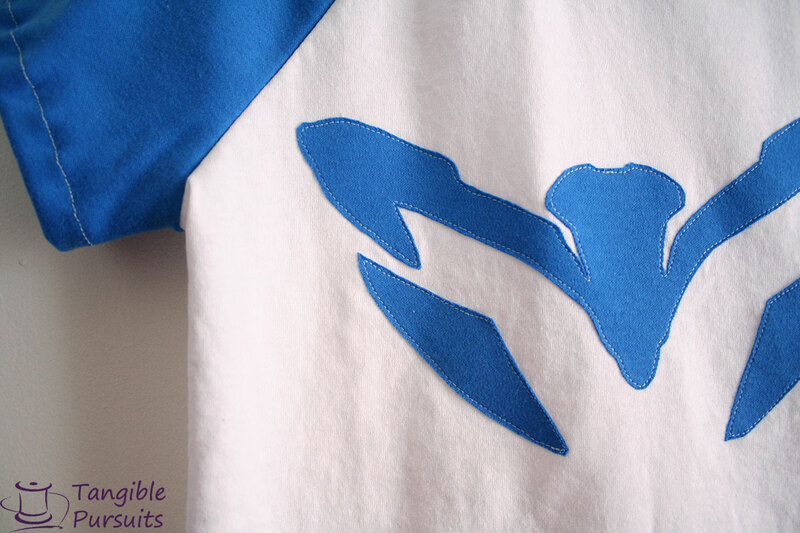 Thanks for linking up with Embellish is for BOYS!